Set aside the show’s muddled logic, the cheesy Andrew Lloyd Webber title, and the pretend rationale that this is anything more than an excuse to bring in crowds. 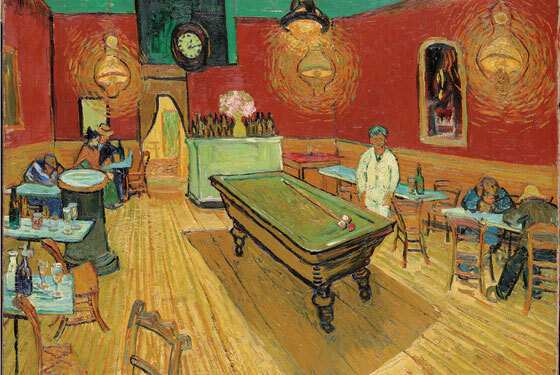 The Night Café and The Starry Night still emit such pathos, density, and intensity that they send shivers down the spine. Whether Van Gogh thought in color or felt with his intellect, the radical color, dynamic distortion, heart, soul, and part-by-part structure in these paintings make him a bridge to a new vision and the vision itself. “Colors of the Night” clicks, despite all its flaws, because it is compact. Comprising only 23 paintings, nine drawings, and a few letters and books, it reminds us that small surveys can deliver more punch than windbag blockbusters. In the first of its four sections, “Early Landscapes,” we see flat-footed work by the self-taught late bloomer, revealing that Van Gogh, like Pollock, was one of the least naturally talented artists ever, that he virtually willed himself to greatness. From there, we see his progression through work painted while Van Gogh lived with his parents and versions of Millet’s The Sower. Finally, in “Poetry of the Night,” Van Gogh begins soaring, as he finds his own style. Here, we glimpse one of the most astounding developmental surges in the history of art, as he rejects the smooth surfaces of the past and reconnects to Velázquez, Rembrandt, Hals, and Corot, artists whose paintings never deny what they’re made of. The Arles pictures of a dance hall, river workers, and the Big Dipper over the Rhône; The Night Café; and two astounding drawings make you understand what Van Gogh meant when he wrote, “I put my heart and my soul into my work, and have lost my mind in the process.” These are works of outrageous vulnerability, and in this last part of the show, we see Van Gogh, having checked himself into an asylum, bravely suffering the disintegration of his soul. He didn’t survive this disintegration, but his best work takes us to an almost bottomless level of consciousness.